Blog Got a Meeting, Need Some Catering from Coffee Worx? Got a Meeting, Need Some Catering from Coffee Worx? Got a Meeting, Need Some Catering? Coffee Worx is a local coffee roaster in Christchurch with an Espresso Bar and Distribution Centre in Sockburn. We are open Monday to Friday from 7am to 3pm serving our award-winning coffee, authentic bagels and fresh cabinet food. 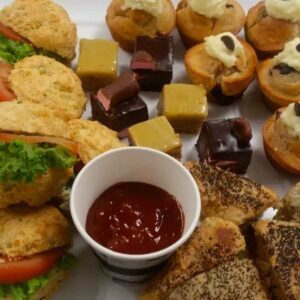 As we are in the business hub of Wigram, we are now providing office catering for staff meetings, sales meetings and celebrations. We can cater for numbers from 6 to 60 and offer baked goods and cabinet items including vegetarian and gluten free options, or our exclusive bagel platters. We can also make coffees-to-go for office shouts and morning tea’s. Just let our experienced staff know what your requirements are, and we will work with you to find an appropriate selection for your budget. An example of a catering platter: mini sausage rolls, mini slices, muffins and savoury filled cheese scones. Give us a ring on 03 3415474, or email enquiries@coffeeworx.co.nz for more information and we can come up with a plan together.